It's Quilting Time! When Grandma Giddywinks playfully exclaims this phrase, get ready to be spoiled the way only a grandma can, with hours of delightful puzzle-solving fun! Every quilt has a distinct pattern, and it is your objective to try and impress Grandma Giddywinks by uncovering the pattern and completing your quilt block before time runs out! With many patterns to complete and plenty of quilt fabrics to choose from, the varieties of quilt puzzles are endless. Earn gold coins with every correctly placed quilt piece, as well as special achievements called Quilting Feats as you improve on your previous scores and times. 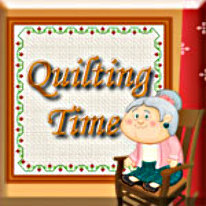 Loveable Grandma Giddywinks will be your crafty guide through Quilting Time, offering useful advice as you solve puzzles that will amplify your creativity as you create your own virtual quilts that you can print and share! Get ready for Quilting Time!